Kinetic is a new generation of interactive input devices. Building on the well understood principles of kinesthetic learning, Kinetic puts the fun back into learning while offering a highly effective means for teachers, therapists and carers to achieve solid learning outcomes. 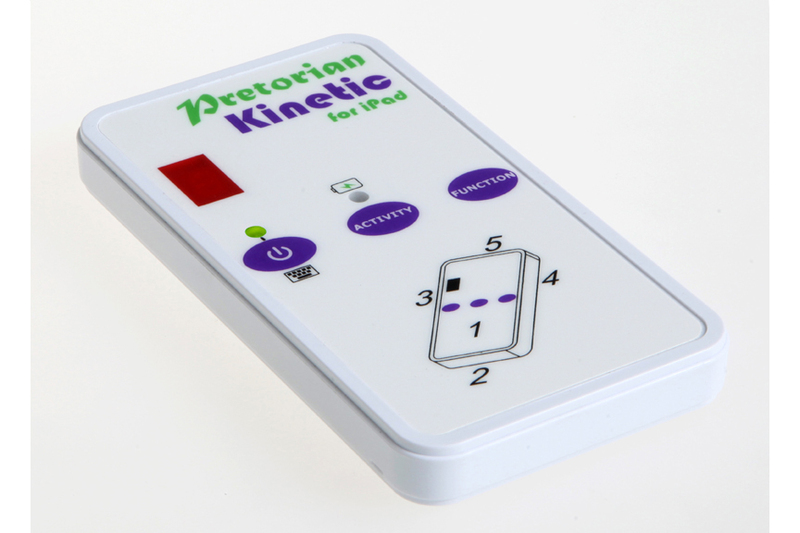 The product contains a gyroscope which is able to determine its orientation and send this information wirelessly either to an iPad or one of Pretorian’s SimplyWorks receivers. It is also able to determine when it is tapped or moved in a particular direction. Kinetic may be used for many different activities. For example, place the unit in a soft play cube and link it either to Smooth Talker or our Smooth Talker AAC app and a different message plays as each face of the cube is turned uppermost. Use a soft play cube with pockets on all sides and it is possible to make the messages match the images you insert into the pockets. You could use images of animals (and their corresponding noises), shapes, textures, colours or even use it as a speaking dice. The possibilities are almost endless. Kinetic also has a Find-Me activity where the therapist asks that the user finds a particular image on the cube. When they successfully find it, they receive a ‘reward’ such as a clip of their favourite music. Find-Me-Sequence activity builds on this principle by asking the user to find all six images in turn. Kinetic can also be made to be a soft switch when inserted in a soft play shape and is ideal for sensory rooms. It can even be made to turn on toys and mains electrical devices through our SimplyWorks range. There are so many things you can do with Kinetic, it’s impossible to describe them all here, so please click on the Videos tab and watch the videos to gain a better understanding of all that’s possible. 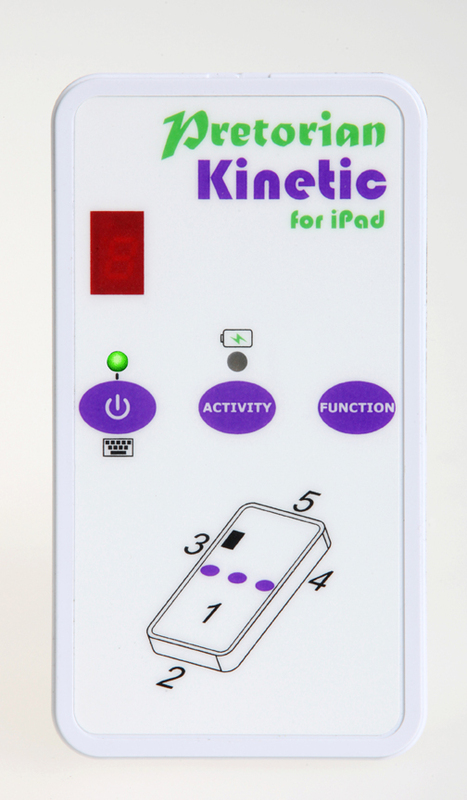 The product is available in two forms- Kinetic for iPad and Kinetic for SimplyWorks. Which to select depends largely on what other hardware it is to be used with. 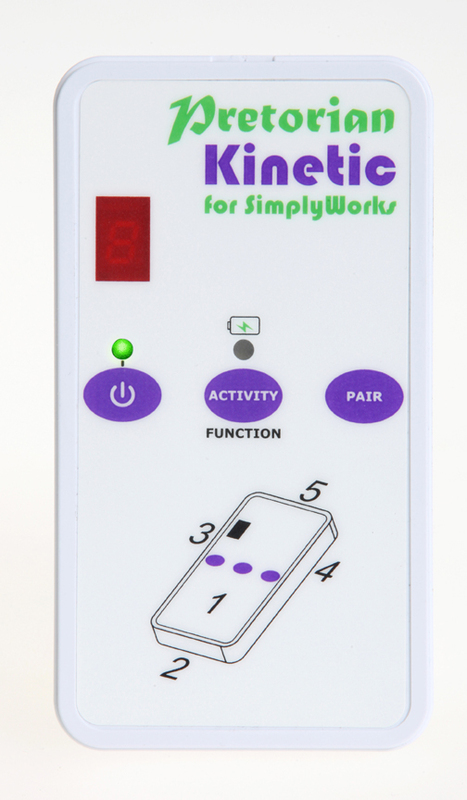 If using it with Smooth Talker hardware or to switch on and off ‘real world’ devices such as toys and mains appliances, choose Kinetic for SimplyWorks. For use with Smooth Talker AAC app or for playing music or videos clips, choose Kinetic for iPad. You can use either product for switch scanning and switch access, for example using Kinetic for iPad with iOS Switch Control or by pairing Kinetic for SimplyWorks with a Receive. Dice - A different message plays as each face of the cube is turned uppermost. Pair with Smooth Talker and then place Kinetic in a soft play cube. Use a soft play cube with pockets on all sides and it is possible to make the messages match the images you insert into the pockets. You could use images of animals (and their corresponding noises), shapes, textures, colours or even use it as a speaking dice. The possibilities are almost endless. Find-Me - The therapist or care giver asks that the user finds a particular image on the cube. When they successfully find it, they receive a ‘reward’ such as a clip of their favourite music or a toy or appliance turning on. Use with a soft play cube and Smooth Talker, Control, Control Pro or Energise. Find-Me-Sequence - activity builds on the same principle as the Find-Me activity by asking the user to find all six images in turn. Use with a soft play cube and Smooth Talker, Control, Control Pro or Energise. 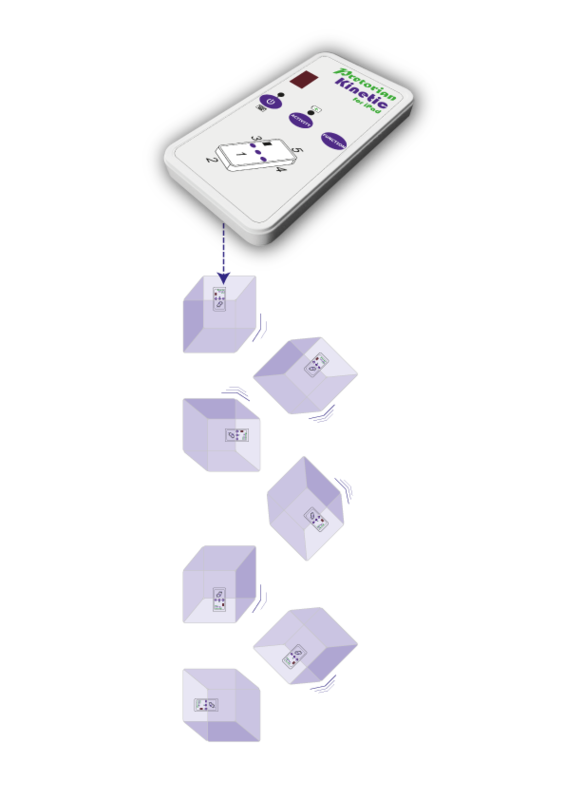 Dice-as-a-Switch - Gives a switch output each time the dice is turned to a new face. Use with a soft play cube and Smooth Talker, Control, Control Pro or Energise. Tap - Gives a switch output each time it is tapped (or caught in a throw-and-catch game). 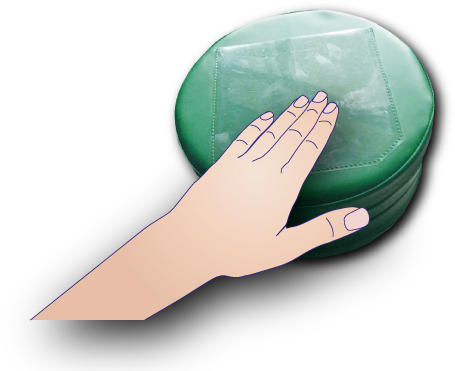 Place in a cushion or pillow and it becomes a soft switch which is ideal for sensory rooms. Use with Smooth Talker, Control, Control Pro or Energise. Tilt/Float - Gives a switch output each time the unit is tilted beyond 30°. Can be used as a tilting switch either in a soft play cube or placed in a waterproof box to be used as a float switch in a hydrotherapy pool. Use with Smooth Talker, Control, Control Pro or Energise. Wireless operation either over SimplyWorks or Bluetooth (for iPad). Built in lithium-ion rechargeable battery. Programmable for Activity and output Function. Kinetic is available in two versions: Kinetic for iPad and Kinetic for SimplyWorks. Which one will be the best for you is largely dependent on what you intend to use it for. The following table gives an insight into which of the two products to choose for particular tasks. 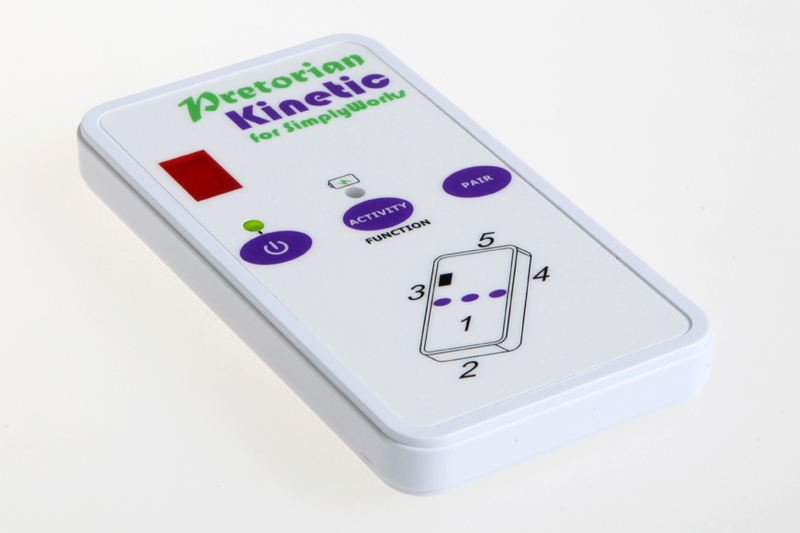 On the whole, if you intend to use Kinetic with any SimplyWorks equipment such as Smooth Talker hardware (to play messages), Control, Control Pro (to control toys), Energise (to control mains appliances) or Receive (into a PC or Mac) then you should choose Kinetic for SimplyWorks. Otherwise, choose Kinetic for iPad. If you are still having difficulties choosing which product you should purchase, please contact us for assistance.